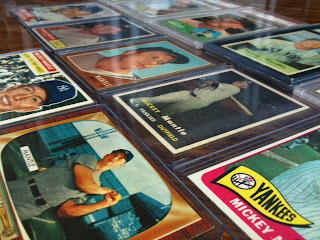 We just had a long-time customer sell sixteen Mickey Mantle cards back to us. The cards range from 1953 all the way to 1969 and include five cards that grade PSA 7. We originally wrote about most of these cards in our of our first blogs, which talked about all of the PSA-graded Mantle cards. Most of these cards sold a few months after this original blog article was written. Everything else grades Excellent and above. The consensus at the office is that the rarest of these cards is the 1955 Bowman. We rarely get a chance to see this card due to condition issues, which stand out on the wood grain television border, and scarcity. This is a pretty thorough collection of the Mick's career but also demonstrates the evolution of both Topps and Bowman as they celebrated one of the best hitters of the 1950's and 1960's. Listed below is the entire collection and links to the individual card on our website.